During the Olympic Year 2000, we thought you'd enjoy reading about one of Walkerville's very own Olympians who participated over 60 years ago, when the event was a much simpler affair. Ian Allison was born in Greenock, Scotland. As a boy, his family emigrated to Canada and lived on Monmouth Rd. across from Walkerville Collegiate, where he would eventually win numerous medals for basketball, soccer and track and field. Ian was an all-conference halfback in football at Assumption College, and played for the championship squad at the University of Toronto. After college, he returned to his roots, teaching and coaching at Walkerville for 40 years -from 1933 until his retirement in 1973. In 1934, Ian married Jean, a Walkerville secretary. They eloped in Bayfield and had two daughters, Heather and Jane. Jean accompanied Ian to Berlin in 1936, where the boys from Windsor represented Canada at the Olympics. According to Jane Peckham, (nee Allison) her parents often spoke about the military presence in Berlin. Soldiers were everywhere and swastikas draped the streets. Hitler watched the Games carefully, but refused to attend the medal ceremonies when African American Jesse Owens was recognized for his gold winning performance in track and field. 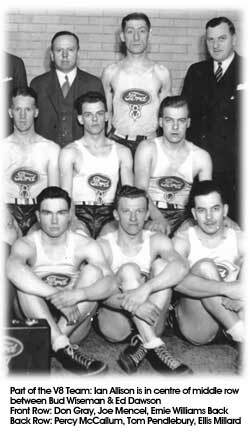 1936 was the first year that basketball was played as a medal sport at the Olympics. Team Canada, formerly known as the Ford V-8's, performed admirably. On outdoor courts, they defeated Brazil, Latvia, Switzerland and Poland, with Ian scoring 20 points total in those games. Their gold-medal opponents were none other than the boys next door, Team U.S.A. Ian's teammate Jimmy Stewart exclaimed, "Oh, Al, they're so tall!" To which Ian replied, "That's okay, we'll just run between their legs!" Playing in a steady downpour, the Canadian team ultimately lost to the Americans 19 - 8, with Ian Allison scoring four points. They proudly brought home the silver medal for Canada. One of Ian's memorable moments from those Olympics was meeting Dr.James Naismith, a fellow Canadian and the founder of basketball. His daughters still have their father's Berlin picture, autographed by Dr. Naismith, and Jesse Owens. Returning to Windsor, Ian resumed his teaching career. Four years later, he was back on European soil, with a very different kind of team. Attached to the Calgary Tank Corps, Major Allison saw action at Dieppe and Monte Cassino, again bringing home medals but this time for bravery. When World War Two ended, Major Allison was back at Walkerville Collegiate. Teacher, coach, and athletic director, he was often seen in the halls carrying his trusty pointer or yardstick. The "Major" was well respected by his colleagues at Walkerville and was known for his poise and credibility. Early on, he coached his basketball team to victory over the previously unbeaten Assumption Purple Raiders, 19 - 16, to win the WSSA title. Ian also took great pride in the track and field athletes he worked with, like Richard Rau, and Jack Cowan. In fact, he even taught Walkerville Times editor Elaine Weeks how to hurdle! There is a story, confirmed by a colleague as well as Ian's daughter, about the day in 1965 when Walkerville flew the new Canadian flag for the first time. As the students gathered on the front lawn, Major Allison, a staunch Union Jack supporter had the honour of raising the flag. As the flag unfurled at the top of the flagpole, everyone looked up to admire the red Maple Leaf - flying upside down. As well as being involved with high school athletics, Ian continued his commitment to the cadet corps, spending summers at Ipperwash Military Base. He also taught English to new Canadians. Just before his retirement in 1973, Ian and Jean moved to Kingsville. Following Jean's death in 1979, Ian relocated to London, Ontario to be closer to his daughter Jane. His love for sport continued. According to Jane, "Dad got a big charge out of watching his grandchildren's sporting events." Ian Allison died on August 3, 1990. His 3 granddaughters and 3 grandsons have continued the family tradition of excellence in sport. One granddaughter is currently attending Colorado State on a volleyball scholarship, and a grandson will be attending Ohio State on a volleyball scholarship in the fall. Although Mr. Allison's Olympic feats were often taken for granted by his daughters when they were younger, his grandchildren are very impressed by his record, prompting his grandson Scott to even consider changing his last name to Allison. In 1981, the V-8 team was inducted into the Canadian Basketball Hall of Fame, and in 1988, Ian Allison was inducted into the Windsor-Essex County Hall of Fame. Special thanks to Mrs. Jane Peckham (nee Allison) of London, Ont. for sharing her memories.